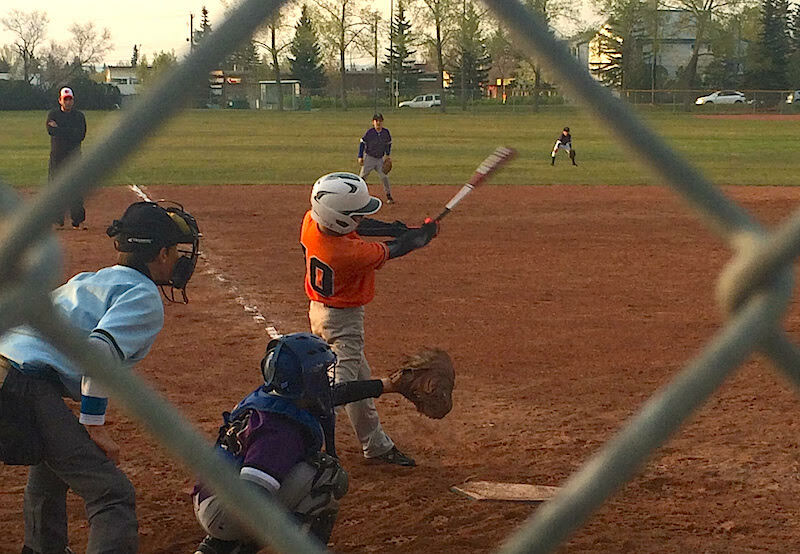 My son started playing little league baseball this year and it’s been a learning experience – for both of us. We started throwing a baseball a few years ago, but he never played seriously. Then last summer I realized that he had developed quite an arm. This season, he started playing Little League ball. Baseball has been a favourite pastime for generations. I never played baseball myself (well, I played some softball) and I was a on (early 1990s Blue Jays) and off (ever since then) fan over the years. But as my son gets into the game more, it’s starting to grow on me again. Baseball, like many minor league sports, is a metaphor for life. How we deal with baseball is a reflection on how we deal with ourselves, our success and failure, our teammates, our role as team players, pressure and stress, etc. The game is a remarkable combination of mental alertness AND physical ability. The whole gamut of life’s challenges is encapsulated in baseball. Take the concept of making mistakes. No one likes to make mistakes, but my son is right up there among the perfectionists. He HATES to make mistakes – not unlike his father, it should be pointed out. And yet, baseball is all about mistakes – fielding errors, strike-outs, pop flies, walked batters, bad throws, etc. In fact, mistakes happen more often than not in baseball. Good batters only hit the ball 3 or 4 times out of 10, which means the other 6 or 7 times they are failing to hit the ball. How we learn to manage mistakes and failure in life is often the key to our success – and it’s most certainly the key to success in baseball. 1. Everyone makes mistakes. EVERYONE. Sometimes, the winning team is the team that makes a few less mistakes. Even ONE less mistake. A winner is just a loser that tried again. 2. A winning team has (at least) nine players. While some positions are more glamorous and get more attention in baseball (eg., pitching or catching), successful teams require each player to play their position well. Even if you’re sitting out in left field and you get one or two hits to field in a game, playing that position as well as you can is the first and most important way you can support your team. This goes for every team in every endeavor. 3. We need to learn from our mistakes. In fact, that’s how we learn everything. We try and fail, then make corrections until we succeed. It can be frustrating and painful at times, but I am not aware of any other way to become really good at something without making lots of mistakes. 4. Some people make more mistakes than others. We are all on a different path of learning. Some guys can really hit, but can’t throw or are not smart on the base path. Other guys can’t hit well, but they get walked a lot and are smart on the bases and score runs. We need to support our teammates and help them to do better in the areas where they need help. 5. We can learn from our teammates. As a corollary to the previous point, we all have strengths and weaknesses. Working as a team means learning from those that are better at certain things, while helping those that need it. Ask the guy who’s a great hitter for some tips, then offer the guys who’s afraid of the ball some support. 6. Don’t get down on yourself. It’s normal to feel frustrated with yourself for making a mistake and letting your team down, but don’t get down on yourself. Holding yourself to a high expectation of performance is good, but you need to learn how to transform this emotion into productive energy and move forward. 7. Recover quickly from your mistakes. Often, what you do right after you make a mistake on the field is more important than the mistake itself. You bobble a ball, but you recover quickly and pick up the ball and throw the guy out. Or you swing on a terrible third strike pitch, but the catcher drops it so you alertly run down to first. Sometimes, we just need to let go of our mistakes and move on – to the moment, the next pitch, the next at bat, the next game, the next season. 8. Games are supposed to be fun. If you’re not having fun, you’re doing something wrong. Figure out how to make whatever you do more fun and chances are you’ll do better at it. This is a life lesson, if ever there was one. 9. It’s just a game. It’s important and it matters in a certain context (i.e., it matters in the game itself). But in the bigger picture, it’s just a game. It’s just a project. It’s just a business deal. It’s just whatever. If you’re truly fortunate, you have your health, you’ll come home to a good meal with friends and/or family and you’ll live in a peaceful country full of opportunity. Have some perspective.